Interview with AC Skipper James Spithill. originally published on SailBlast. 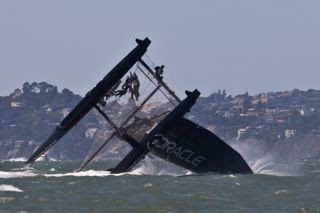 -covering the AC34 in San Francisco. Jimmy Spithill’s version of getting up and heading to the office is just a little different to most. 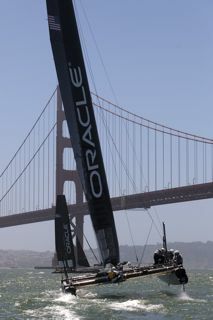 He starts in the gym about 7, heads home for a shower and breakfast, then hits the ORACLE Racing HQ at San Francisco’s Pier 80 for an operations meeting which sets the team’s agenda for the day. This week the focus has been on trialing equipment with Race Committee and umpires. A sailing team debrief follows where the team discusses what happened the previous day on the water, analyzing video footage and working with coaches Philippe Presti and Darren Bundock (aka Bundy). Meetings over, it’s time to crank up the pace and get out on the water. “It’s a full day,” says Jimmy. SailBlast editor Michelle Slade chatted to the skipper of America’s Cup defender, ORACLE Racing about his first week sailing the AC45 in San Francisco. SB: What have you learned this past week in San Francisco? Spithill: The way the weather works here on the Bay is perfect – from midday on you can be sailing. On these boats you don’t need more than a few hours because it’s so physical for the crew. You get to the point where you start to get diminishing returns because everyone’s starting to get tired. These boats are just physically draining and it takes its toll – you never get a break really. By the time the end of the week comes around you can definitely see everyone needs a couple of days off to recharge. Another thing we’ve learned here is to split the week up, like we’ll do a Mon/Tues sail, take Wed as a maintenance catch up day, then sail Thurs/Fri. You could sail six days a week but you wouldn’t be any better for it. On the old boats, 2-boat testing was draining but more mentally concentration-wise for the drivers and the trimmers. SB: There’s a lot of talk about the athleticism required on the 45? 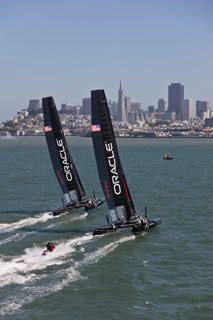 Spithill: It’s definitely a different game – the huge emphasis now is on the athletic side, which I think is good. I have friends who are professional rugby players and they don’t see the athletic side of sailing – they instantly think of guys in a blazer sitting on the side, swanning around the bay. Once people see the 45s, with the cameras and mikes onboard, they see the amount of effort going into it. SB: Has this had a big part in determining who is on the sailing team? Spithill: Definitely. You can’t carry anyone. If you’re on these boats or the 72, you’ve got to be fit and you have to be able to perform, and that can only be a good thing. When you look at it, on the 45, there’s only 4 guys doing all the work as the helmsman can’t do a lot – he can help out with the wing trim here and there. On the 72 it’s the same thing – take the helmsman out and you have 10 guys – you have a wing trimmer, and a front sail trimmer, so you have 8 guys to physically do all the work. They have to be all-around sailors. If you make a mistake or if you’re pushing the edge, everyone’s got to be thinking, “Will I need to ease that sheet if we do a big nose dive , or vice versa.” You never had that on the old boats – you’d be thinking ahead for the maneuver but the consequence of getting it wrong was never a capsize, the consequence, was that we mess a maneuver up or break a pole, tear a spinnaker – now the consequences are serious. SB: What have you been focusing on here training in the conditions that you’ll need to get used to? Spithill: Everyday we’ve been here it’s been windy and we’ve used our heavy jibs every single day. The other thing is learning the race track. It’s a real challenging place to sail – every day is different with the tides and it doesn’t matter what tide mile you look at, there always seems to be some small variation. And, just getting to the lifestyle, the daily routine, thinking about the long term – it’s just been fantastic for the whole team, not just the sailors but the shore guys too. SB: How are you liking the breeze out there? Spithill: It’s just fantastic, it’s soooo good. That Bay has got to be one of the best places to sail in the world – it’s reliable wind, the current makes it challenging and it really is a natural amphitheater – on the 45s you feel like there are some boundaries – it’s very cool. Honestly, you look really look forward to getting up and out there each day. You need weather for sailing – of course there are skills associated with light air sailing but let’s face it, it’s not much fun when you can be blasting around at 30 knots all day. SB: Talking about the speed of the boats – what have you had to do to step up your game at the helm? Spithill: I got into multihulls because of the last campaign so I had a head start but these boats are completely different. The trimaran had an engine and it was a big boat so it was more about keeping the thing in one piece whereas with these boats you really have to sail them as hard as you can. We’re just putting the hours in as with any class of new boat. SB: Your job is to push it…? Spithill: Well, I think it’s everyone’s job, no matter if you’re coaching or sailing the boat. With any good sporting team you’ve always got to be trying to take another step up because at the end of the day you’re always looking for a small advantage. It’s an attitude I think. SB: You’re playing with the edge everytime you’re out there? Spithill: Sure! You’ve seen us capsize these things. That’s a good thing, I reckon it’s great. The whole purpose of these boats is to be able to get out there on a small scale and understand what the 72 is going to be about around the track but also to be able to push. The best way to learn is to make mistakes and I think capsizing is all part of it. SB: What’s going through your mind when you capsize? Spithill: S…T, I’d better find something to hold onto! It goes from us all working together to every man for himself! We have a procedure in place though – you want to get the boat back up as quick as possible. I think capsizing is fantastic for the racing – it’s great for TV, it’s great for the sport. It’s like crashing or spinning out in auto racing. You gotta have it – otherwise it’d be like restricting the Formula 1 guys to first gear. No-one would watch it. The good thing with these boats is that you get rewarded for pushing hard but then you are going to go too far. What we want is if you have a capsize in a race, the chase boats are allowed to come and pick you up and you can keep racing, like a pit crew. That’s something for the commentators/TV to focus on. We want to make these wings bullet proof enough so we can capsize them – just the top needs to be bullet proof as that’s the part that sits in the water. SB: How do you think a capsize in the 72 will compare? Spithill: A lot more dramatic. You’ll never want to capsize a big one. But, these 45s are a different story. You want to go out there and show you are pushing hard, and if you do make a mistake, it’ll be great to be able to pull them up, just like a small boat, and carry on. Most of the teams have capsized now and they just pick them up and sail back to the dock. You don’t have to get towed in. Like yesterday, we broke a few frames during a maneuver because we left the runner on. But we sailed the rest of the day no problem and that’s the key – keeping the boats out on the water. SB: Cascais, Portugal is the next stop – has the Bay been good prep for that? Spithill: Any sailing is good. We have our entire sailing team here right now – all the grinders, so we’re putting them through the experience on the 45 to give them a better understanding of what the 72 is going to be about. Obviously we need to make some decisions for the big boat, at some point so we can start building it – that’s important. We only had a small crew in NZ to keep costs down. SB: Given you’ve had more time on the water than the other teams, how competitive do you think the first World Series event will be for ORACLE? Spithill: I’m not sure we’ve had more time – I think Team NZ’s been sailing a lot. It depends on what you call – if you call it more time in multihulls I’d say the other teams have had more time this year – they’ve been doing Extreme 40s, A-class, they’re doing more than us. We’ve been providing stuff for the teams, we’ve come up with the 45, which is good but takes time and energy away from what we want to do. But for the sport and to make this work, we have to do it. We’ve come up with a concept that we think is going to give the sport the best chance commercially and some people forget this, but if you want to get paid, then you need a good TV/commercial product to sell. Having said that, you saw, even in NZ, the Chinese team – they’ve got some good multihull in Charlie Ogletree and Mitch Booth – they were pretty much up to speed on the last day of racing and won a race. So with all the multihull sailing going on, the good guys will get up to speed straight away. We’ve seen it. SB: This lifestyle is a huge commitment to team and ultimate goal. How do you fit your personal life in that? 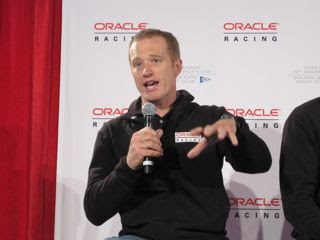 Spithill: It’s difficult. My wife Jen (Jennifer) and two boys (4 and 10 months) live in San Diego but up here now visiting. It’s tough on everyone – we all do a lot of travel and obviously the older your kids get with school etc., it gets more difficult. But having said that it’s also a good education for the kids because they get to experience different cultures and a lot of the kids in campaigns learn different languages etc. It makes them more independent and let’s face it, kids today want to travel. I think there’s lots of positives which is what you have to take from it. We’ve spent most of our time in Valencia or New Zealand with the different campaigns. It’s a tough lifestyle but tell you what, I just love it!